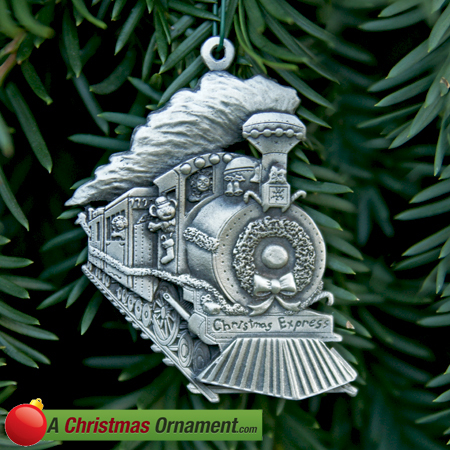 Christmas Ornaments Made in USA - Pewter Christmas Express Train Ornament - A Christmas Ornament Co.
A beautiful Christmas wreath with a giant bow hangs on the front of the Christmas Express Train as it heads full-steam ahead. Above the wreath hangs the first present of the holiday season and the last to be delivered on Christmas Eve. Look closely and find your favorite children’s' toys acting as conductors and passengers as they travel from the North Pole on this fun-filled train. The Christmas Express Train ornament is made with pride in the United States and measures 2-1/2" tall and 2" wide. The ornament is made with hand cast fine pewter and has a special area on the back for engraving to remember a special Christmas.